Poinsettia Study Tour – Latina	Home Grown display wins a prize at the garden show in the Great Yorkshire Show. 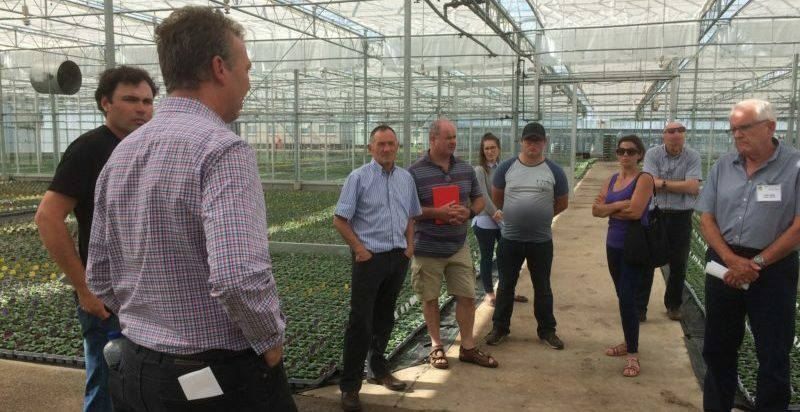 The BPPC has taken up the challenge of engaging with growers throughout the UK and arranged a study tour of the North-West growers, traditionally a very strong area for horticulture and bedding in particular. The tour followed on the North-West’s (and national) favourite annual trade show at Four Oaks Nurseries near Macclesfield and visited two nurseries in Cheshire on the first day. Day two feature three more nurseries further to the North and West in Lancashire and particularly in Hesketh Bank. Following up on the successful tour in 2016 focused on the South Coast nurseries in Hampshire and West Sussex, the BPPC has selected some of the most progressive companies and growers to highlight the technical issues that they are facing. Stuart Halman, Les Halman Nurseries Ltd, kicked off the study tour with a talk about the developments on his nursery with diffuse lighting screens used as an alternative to glass coatings or conventional shading and recyclable plant packs. Trevor Lawrence told the study tour participants about their production of 1.25M blooms for supermarkets from their own selected mother stocks; protected from WFT by biological pest management. Ian Lavelle, Ambroses, explained their thinking on creating a new bedding nursery (on the new farm a few miles from their original nursery) to the study tour. In refining the essentials, they have been able to build a new production unit with elegant simplicity that will be the centre of their operations in future. Their existing nursery being devoted in future to their own propagation and young plant department. At Florna the focus was on their production units and how these have developed in recent years. Chris showed the group how their working processes, some of which are automated, fit into the glass and polythene structures. One of the newer polythene houses has survived the very windy site well but has been reinforced in some cases with Keder panels instead of the original film.